LinuxKit was introduced at last DockerCon 2017 in Austin,TX and it’s announced as “a toolkit for building custom minimal, immutable Linux distributions”. This basically means you can package and run your application within a minimal Linux-based OS where you are able to use only the parts you really need for your application to work. You can select the Linux kernel of your choice, some required system services and your application code to bake them all together in an executable machine image. With LinuxKit you can easily create your custom images for bare metal, different hypervisors or cloud providers. Through the help of Docker container technology you run everything inside containers: all onboot and system services, all additional application services are packaged individually as Docker Images and will be run in an isolated environment. This gives you the full control over all the ingredients and makes sure that all components are isolated against each other as well. 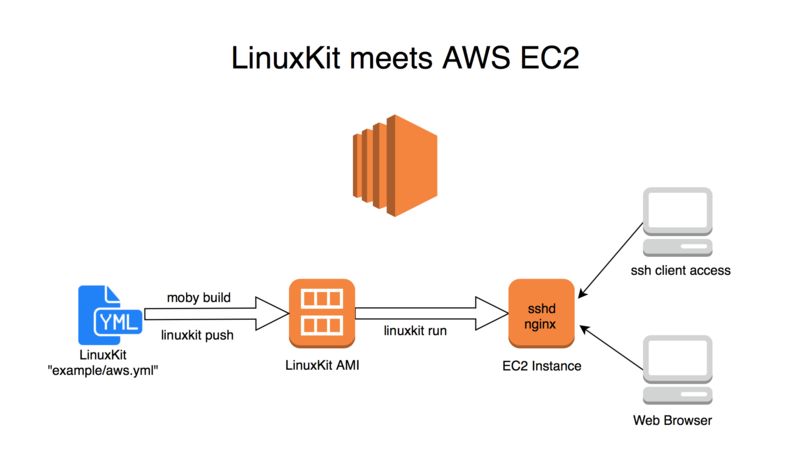 Right now the LinuxKit development team is working on the integration to support building and running LinuxKit images on AWS EC2. The first steps are already done, so I was eager to take my hands on and was trying to build a first example application and run it directly on AWS as an EC2 instance. In order to create a RAW image with the help of LinuxKit, first we have to install LinuxKit. Here I’m covering the install/build process on macOS. 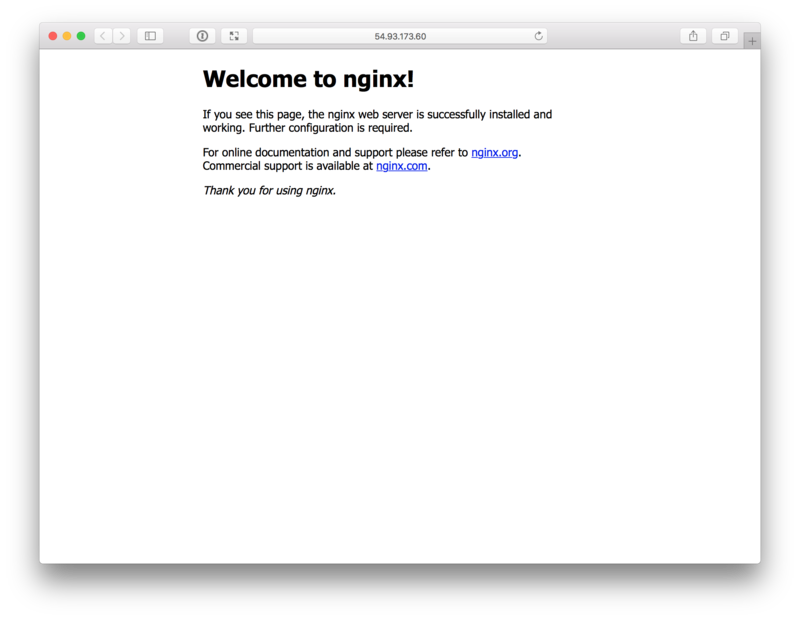 As a prerequisite we need some tools installed on macOS, like git, make and Docker for Mac . Let’s clone the latest LinuxKit repo, so we can start using it. We’re going to checkout the exact same version which we’re used for this blog post, so you can replay all the steps by yourself. $ git checkout 11b1eb75ad7cf64b6a58d5513431a4b941ff0ba8 # use same version! Build and install LinuxKit with make. With the make command you build the latest CLI tools linuxkit and moby in the local ./bin/ folder. And finally with make install we’re just copying them over to /usr/local/bin, so that they’re installed on our system and we can use them easily. So let’s check the versions of the tools we’re going to use now. With the current version of LinuxKit we’re not able to create a correct RAW image directly (but this feature will be added soon), so we’re creating a qcow2 image first and then convert this to a RAW image with the help of the tool qemu-img. Now we’ve got a VM image build with LinuxKit in .qcow2 format. The next step is to convert the .qcow2 image into a .raw image with the tool qemu-img from the QEMU project. As we don’t have the tool qemu-img installed natively on macOS, and we’d like to use Docker for this purpose, we’re creating a small Docker Image with just this tool installed. So we don’t have to install it on macOS. $ docker build -t qemu-img . Now we do have defined an alias qemu-img and can analyse our RAW image with. In the background there will just be a Docker container started for every invoke of this command. We can easily convert the .qcow2 image now to our required RAW image. The RAW image is quite large is size, because it’s unencrypted. But before we upload this RAW image to S3 we should check the file type again. As you can see, we just used a few simple tools and commands to create a first LinuxKit image locally on macOS, converted the image into RAW image format which will we accepted by AWS. And with the help of the Docker Engine we were able to do this without installing any additional tools and software on our Mac! In order to use S3 and the AWS cli you should have the AWS tools installed and logged into your AWS account. For Installing the AWS tools you can use Homebrew. After the installation you can configure your aws cli with aws configure. I recommend to make a separate user in the IAM. Here I’m using a S3 bucket with the name dr-raw-images. Uploading the RAW image will take some time, as it’s about 1 GByte in size and the file transfer depends highly on your internet connection. Check, if the LinuxKit image is available on our S3 bucket. Now we do have our LinuxKit image successfully uploaded into a S3 bucket where we can pick it up by the next step and import this image as an EC2 snapshot. Creating an EC2 snapshot from a RAW image stored in a S3 bucket is quite easy, and we can follow the first two steps of the documented way from Importing a Disk as a Snapshot Using VM Import/Export. We have to define a disk container, so we can import the RAW image. Here we use our S3 bucket name and the file name of the RAW image, that’s all. Now we can start the import process, which will take a few seconds or maybe minutes to complete. The next Steps are explained as well from the Amazon Docs for Import IAM permissions. Or the next steps below will do the same for you. After the policy is created you can run the import command. Now we need to define the role policy for our bucket. Replace dr-raw-images with your bucket name. Again we need to apply the role. Now you can edit the command from above again and we’ll get an instant API feedback. With the instant API feedback in form of a JSON message where we get some important details we need for the following step. We just pick up the ImportTaskId and can check the progress of the import snapshot task. Here we see the import is still in progress "Progress": "35" and we have to wait for completion. Once the import is complete we’ll see the following API result. Please pick up the SnapshotId which will be needed for our next step. Here is our most interesting step. We’re creating the final LinuxKit AMI directly from the EC2 snapshot. If you want to learn more about this step, you can read the section “Creating a Linux AMI from a Snapshot” from the docs at Creating an Amazon EBS-Backed Linux AMI. At the end we did create a new AMI from our LinuxKit image and get back the AMI ImageId “ami-5f25ff30”. By default no network access is granted to a new EC2 instance, so we have to create a new security group first and open some TCP network ports we’d like to access from the outside. --description "Security group for LinuxKit in EC2"
Take the security group GroupId from the API answer as we’ll need it later when we start the EC2 instance. As our LinuxKit VM has a built-in SSHD and a Nginx webserver we’re going to open the network ports 22/tcp and 80/tcp. Now we did setup all the basic things and we can start a new EC2 instance using the required parameters for AMI, security group and SSH key pair name. After a few seconds or maybe a minute the EC2 instance should be up and running and we can get their public IP address from the EC2 web console. If you need help to connect to your instance via SSH, just hit the Connect button and you’ll get the instructions. To prove that everything went well, we try to login via SSH. The authenticity of host '54.93.173.60 (54.93.173.60)' can't be established. ECDSA key fingerprint is SHA256:7KIfPSuli4OrmIsQhwoq/pfTs5M2ACJevOzlQ0waVxE. Warning: Permanently added '54.93.173.60' (ECDSA) to the list of known hosts. …or we just open the default web browser. This blog post showed the technical details about how to create a LinuxKit image and import it as a custom AMI to Amazon EC2. All these detailed manual steps can be used to understand the whole process a lot better and could be used as a basis to fully automate the creation of custom AMI’s in general. In the meantime the LinuxKit development team is working hard to improve and automate this process and is going to implement the complete AWS support into the next version of LinuxKit. One of the next steps will be to update moby tool and qemu fixes, so it is possible to create a RAW image directly with moby build -output img -size 200M and define the resulting disk image size. Another improvement is in development now to include linuxkit push and linuxkit run commands with a direct AWS support using the AWS API internally. The development will hopefully takes only a few days more and should be available next week or so. We’re eagerly looking forward to see the complete AWS support in LinuxKit pretty soon. While working on getting my first LinuxKit image running as an EC2 instance I was looking for some deeper technical informations, but wasn’t able to find all answers by myself. Maybe someone out there could help and I’d like to place my open questions here. How can I attach to the serial/UART console of the VM really early in the boot process? Currently I know you can get the boot logs later when the VM is successfully booted, but I’m more interested in an early access from the first second on. Then it would be possible to see all problems and errors which occure even when the VM can’t boot at all. An EC instance is running in a Xen hypervisor and therefore it should be possible to attach the serial tty console with all the kernel logs from the VM, but I can’t find any API to do so. What is the exact boot process of an AMI in EC2? When I’m starting a new EC2 instance based on a LinuxKit AMI it will take some seconds until the instance is booted and I can already access it via SSH. But at the AWS EC2 web console it takes a few minutes until the instance will be displayed as booted and operating normal. Are there exists any detailed informations and specs about creating and running custom AMI’s? It seems there is something going on in the background with checks and additional attemps to provision the machine. I guess there is even more room for improvements as soon as we can understand all the details. So, if you could answer at least one of these questions or you could share some pointers I’d really appreciate your feedback! As always we want you to give us your feedback and share it on Twitter. So, please send us your feedback or tweet your thoughts and ideas on this project at @bee42solutions.